Find out what our experts have to say about Ninja 300! Choose the Ninja 300 which fits your bill! Choose the Ninja 300 which fits the bill of you. 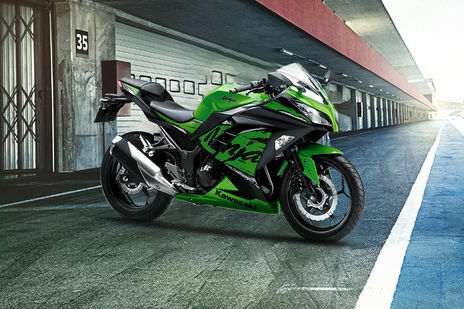 Kawasaki launched the Ninja 300 sports bike as more of an upgrade to its better-selling sports bike, the Ninja 250R. The Ninja 300 is one of the best bikes in the 300cc sports bike segment. However, when initially launched in India, it lacked ABS and came with a hefty price tag of Rs 3.63 lakh (ex-showroom Delhi). But, Kawasaki recently launched the upgraded 2018 model of the Ninja 300, addressing both the pain points. The 2018 Ninja 300 is offered with ABS as a standard feature and the price was slashed by Rs 65,000, thanks to extensive levels of localisation. The Kawasaki Ninja 300 now comes to India in the Completely Knocked Down (CKD) way and is assembled at Bajaj’s Chakan plant, due to which the sports bike now retails at Rs 2.98 lakh (ex-showroom Delhi). This acted as a boon to Kawasaki and the sales of the Ninja 300 sky-rocketed to a record high. 228 units of the Ninja 300 were sold in September 2018 as compared to 32 units sold in the same month last year; that’s an increase of 613 percent. The Ninja 300 has now become the best selling twin-cylinder motorcycle in the country. The latest 2018 model of the Ninja 300 looks pretty similar to its predecessor, in terms of the overall design. However, it is now offered in two new colours - Candy Plasma Blue and Candy Lime Green. The fuel-tank also gets bigger and can now store 17 litres of fuel. It gets a new high tensile steel frame which enhances chassis stability, while the tyres are now sourced from MRF for more cost-effective pricing. The closest competitor to the new Ninja 300 is the Yamaha R3. With the recent price cut, the Ninja 300 is now Rs 50,000 cheaper than the Yamaha R3 which gives it an upper hand. Other notable competitors include the TVS Apache RR 310, the KTM RC 390 and the Benelli 302R. The design of the Ninja 300 is inspired by the Ninja ZX-10R, featuring sharp aerodynamic lines. However, there are new graphics on the side fairing that flaunts the Ninja 300 badge, spread across the panel. There are new decals which make the design look more aggressive. At the front, the Ninja 300 is quite aggressive featuring a twin multi-reflector headlamp with built-in indicators and a floating windscreen. The handlebar is nicely placed and the rear view mirrors are pushed out a bit. The sides feature ventilated fairings with new decals and a Ninja badge. The beefy fuel-tank adds to its impressive looks and the new footpegs are also noticeable. The rear profile features a minimalistic tail with a sharp LED tail lamp, split seats and an upswept exhaust. An optional, removable rear grab rail is also offered that goes all the way to the tail from the pillion foot pegs. The highlights of the fairings are its smartly-designed air-intakes, fin design and holes which effectively takes care of the heat management. The black-coloured alloy wheels also add to the visual appeal of the bike. The instrument console is a semi-digital one and readouts like odometer, tripmeter, and speedometer are digitally displayed. The new Ninja 300 draws power from a 296cc, parallel-twin, liquid-cooled, 4-stroke DOHC engine with fuel injection system, that has a compression ratio of 10.6:1. It produces 39PS of max power at 11,000 rpm and 27Nm of peak torque at 10,000 rpm. It is paired with a 6-speed gearbox. Shifting gears is very smooth and the bike now comes with an upgraded clutch, which has Assist and Slipper functions. This prevents any kind of wheel hopping when downshifting from higher revs. The engine has been fine-tuned and feels very refined, especially at higher revs. It absolutely glides and easily touches triple-digit speeds on highways; moreover, the best part is that in city traffic, you can easily ride it on higher gears, even at low speeds, without any vibrations. This fast sports bike can touch a top speed of 144 kmph and Kawasaki claims it can return a mileage of 32 kmpl on city roads. A dual-channel ABS is offered as standard on the Kawasaki Ninja 300. Braking duties are carried by a single petal 290mm disc at front and 220mm disc at the rear. Suspension setup consists of a 37mm conventional telescopic front fork and Bottom-Link gas-charged rear shock absorbers with adjustable spring preload. It now comes fitted with 17-inch black-coloured alloy wheels wrapped in MRF Nylogrip Zappers tyres, 110/70 at the front and 150/60 at the rear, which offers a better grip than the previous IRC tyres. Built on the tubular diamond frame, the Ninja 300 offers excellent riding experience. The seat height is only 785mm, making it idle for both tall and short height riders. Even though the kerb weight of the bike is 179 kg, it is easy to manoeuvre around. The Ninja 300 comes fitted with the world’s smallest dual-channel ABS unit that increases the efficiency of the braking system. Braking is done through a single petal 290mm disc at front and a 220mm disc at the rear.